Did you lose some of the contacts on your iPhone? Are the contacts you lost backed up to a recent iTunes backup? The logical solution in this case would be to get the contacts back from iTunes. However， as simple as that sounds and as reliable as iTunes can be sometimes, it is not the only solution out there. Sure, you can get the contacts back by simply restoring the backup but what if you don't want to restore the backup? In this article we take a look at how you can transfer contacts from iTunes to an iPhone, explain to you the shortcomings of using iTunes method and provide you with an alternative solution. Like we've mentioned, iTunes offers a simple reliable way to transfer data from an iTunes backup to your iPhone. Provided the contacts you need are on an iTunes backup, the following steps should help you get the data back quickly and easily. Step 1: Begin by ensuring you do have a recent backup of the data on your iPhone in iTunes. Also, make sure that you are running the most recent version of iTunes. Step 2: Next, you need to erase the contents and settings on your iPhone to get to the set-up screen. 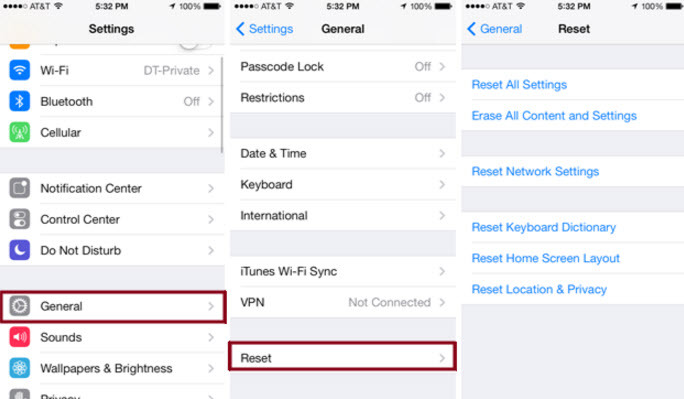 To do that go to Settings > General > Reset > Erase All Contents and Settings. 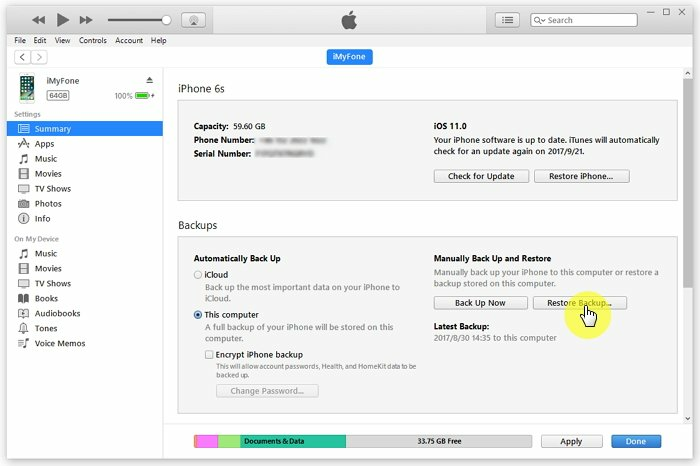 Step 3: Follow the on-screen instructions until you get to the "Apps & Data" screen and then choose "Restore from iTunes Backup". Tap "Next". Step 4: Connect the device to the computer and then open iTunes. Select the iPhone when it appears in iTunes. Step 5: Select "Restore Backup" and then choose the most recent backup. If the backup was encrypted, enter the password when prompted. Step 6: Keep the device connected to the computer and wait for the whole process to the complete and you should have your contacts back on your iPhone. There are two main problems with this method. To begin with, you have to erase all the contents and settings on your device before you can restore the contacts. Also, you are not able to simply get into the iTunes backup and restore just the contacts as opposed to everything else. That's why we thought we'd share with you a solution that won't require you to erase all the data on your device before restoring and will also allow you to select the type of data you would like to restore to the device. This solution is iMyFone D-Port Pro, a backup and restore tool that is useful in a number of ways. You can use iMyFone D-Port Pro to back up all the data on your iPhone to your computer in a single-click. When you need to restore the data, you can just easily connect the device, launch D-Port Pro and have the data back on your iPhone. The program's most useful feature is its ability to allow users to do a partial backup or restore a partial backup to their devices. 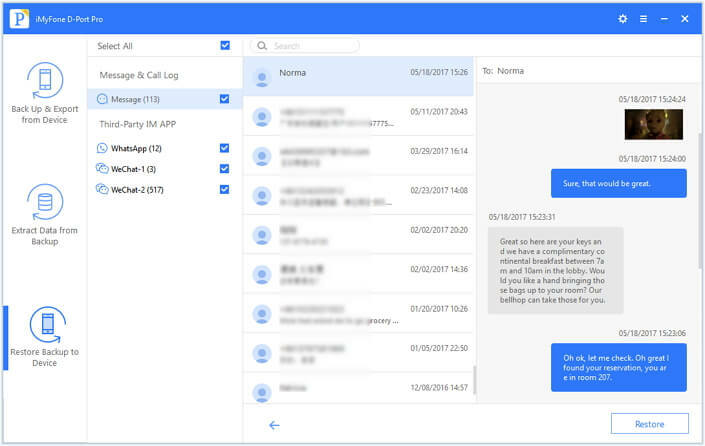 With it, you can back up just messages, WhatsApp data and WeChat data to your computer. 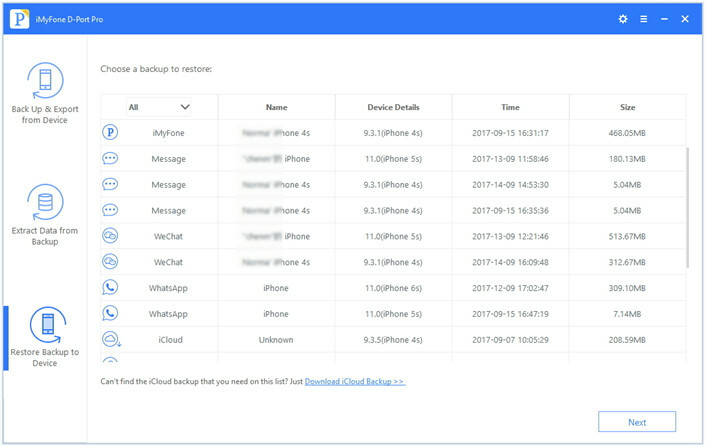 You can also choose to restore just a certain type or several types of data from your iTunes, iCloud or iMyFone backup. Download and install iMyFone D-Port pro to your computer and then follow these simple steps to partially restore iTunes data to your iPhone. Step 1: From the program's main window select "Restore Backup to Device". Then there will be a list of all the backups on your computer. You may need to connect the iPhone to the computer and then wait for the program to recognize the device. Step 2: Choose the relevant iTunes backup and then click "Restore Partial Backup." Click "Next" to continue. Step 3: In the next window, select the type of data you want to restore and then click "Next." Step 4: The program will then scan the backup for the type of data you have selected and display the results in the next window. 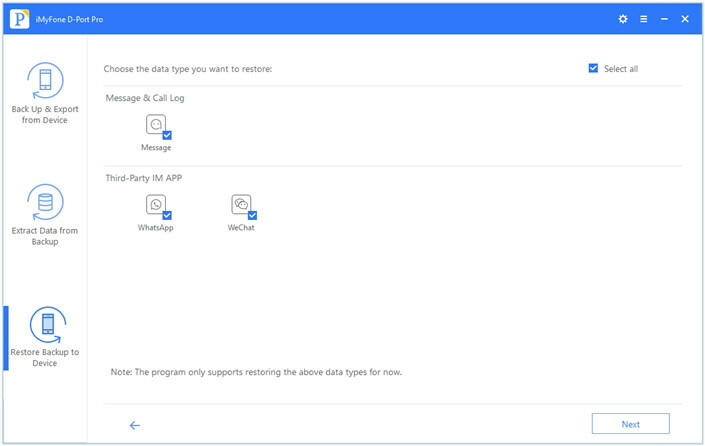 Here, you can preview and then select the data type you want to restore. Click "Restore" when you're ready and the program will restore the selected data to your computer without affecting all the other data already on your device. 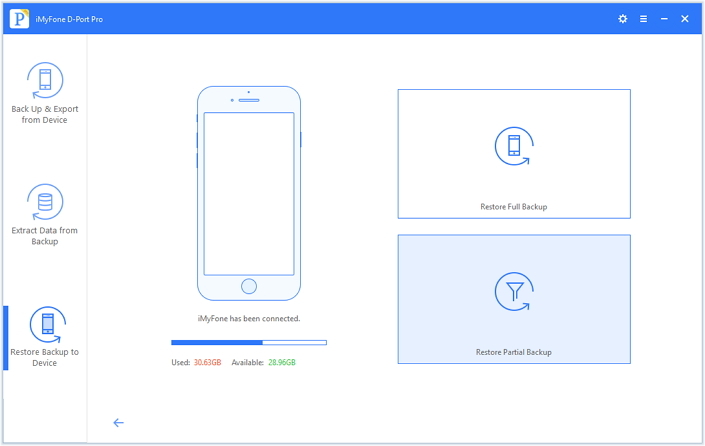 Currently, iMyFone D-Port Pro don't support to separately restore contacts from backups to device, but it will be supported in the next version and more data types will be supported as well. Now we have introduced 2 methods to transfer contacts from iTunes backup to iPhone. Hope you have found the best way to do it.